The hit Kickstarter boardgame, now available on mobile! Defend against waves of horrific aliens in this beautifully illustrated, base defense, deck-building game for 1 to 4 players! In XenoShyft Onslaught players take on the role of a commander in the NorTec Corporation. You’re tasked with defending your division of the NorTec base as wave after wave of horrific aliens attempt to destroy the base and end NorTec’s strip mining operation. 1 – 4 players – Single player compatible, fully cooperative gameplay. Strong focus on coordination and strategic planning – to overcome the game’s intense difficulty players will need to work together. Incredible art – Illustrated by three amazing artists, XenoShyft features beautiful and consistent art. All of which creates one cohesive and frightening universe. 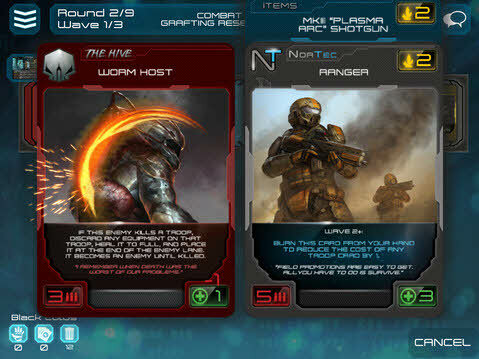 Inventive and exciting armor and weapon upgrade cards – You’ll need to outfit your troops with the best equipment if you hope to survive. Xenoshyft is a game for 1-4 players, with each player controlling one of the divisions of the Nortec military: The Science Labs, Med Bay, Armory, Weapon’s Research, Barracks and Command Center. Each of these divisions represents one part of the overall Nortec base, and it is your job as Commander of these divisions to protect the base while its field operations are completed. You and your teammates will have to work together to survive the continuous onslaught of powerful alien threats and horrors – the goal of the mission is not to wipe out these threats, it is merely to outlast them! Survive through nine rounds of combat with these horrors and the base will have succeeded in its mission, and you and your allies will have survived to fight another day! This entry was posted and tagged 2-player co-op, 3-player co-op, 4-player co-op, iOS Universal, iPad, iPhone, new releases, XenoShyft on November 30, 2015 by admin.